President George H.W. Bush and Mrs. Barbara P. Bush were honored guests at an event last week expressing appreciation for their friendship and recognizing a century of leadership in Orthopedic Surgery at Mayo Clinic. President and Mrs. Bush have a long, close relationship with Mayo Clinic as loyal patients, generous friends and advocates for excellence. From 1993 to 2001, Mrs. Bush served with distinction as a member of the Board of Trustees, the highest governing authority at Mayo Clinic. To recognize their commitment to lifelong learning, Mayo established the George H.W. and Barbara P. Bush Strategic Initiative Fund in Education. This fund creates an endowment that advances the standard of education for generations to come by supporting a diverse array of prioritized initiatives -- from high-technology educational tools to instruction in compassionate care. A display honoring President and Mrs. Bush was unveiled at the event and can be viewed on the 14th floor of the Gonda Building. 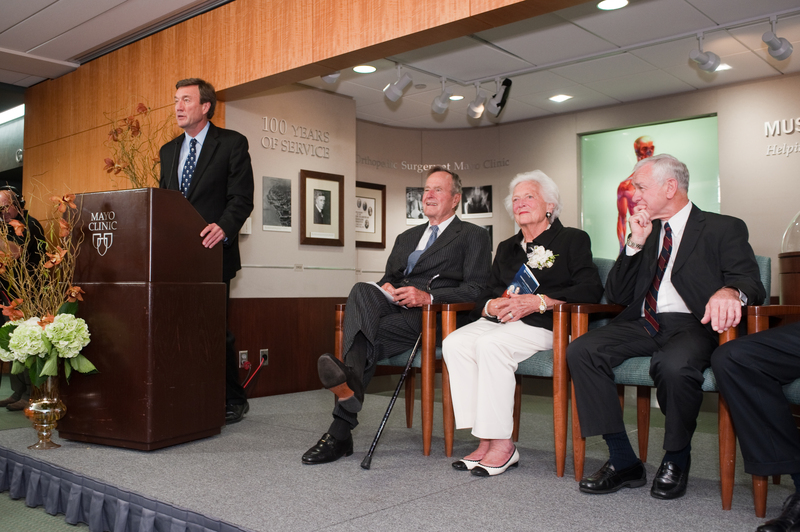 President and Mrs. Bush have a close relationship with the Mayo Clinic Department of Orthopedic Surgery, and they were pleased to help celebrate the 100th anniversary of the department. Mayo Clinic is internationally recognized for excellence and leadership in orthopedic practice and surgery. In his inaugural address, President Bush said, "America is never wholly herself unless she is engaged in high moral principle." Mayo Clinic president and CEO, John Noseworthy, M.D., noted that this call resonates with Mayo's primary value that the needs of the patient come first and that "it is an honor to join the Mayo and Bush names in service to humanity."